How can it be that likely 2017 American League Most Valuable Player Jose Altuve has only 2.5 Box-Toppers points on the season? Here are Box-Toppers top 25-ranked American League batters for 2017. Two of the three AL Most Valuable Player Award finalists are ranked in the top five—Aaron Judge at second and Jose Ramirez at fifth. However, the third finalist, Jose Altuve of the Astros, ranks outside the top 25 in 90th place among AL batters. Three other Astros batters rank in the top 25 ahead of Altuve, the likely AL MVP—Josh Reddick in 11th, Carlos Correa in 20th and Marwin Gonzalez in 23rd. Or should the question be: How is Jose Altuve even considered a candidate for AL MVP when he has only 2.5 Box-Toppers points? The Houston Astros second baseman seems the inevitable choice by baseball writers to be named for top AL honor Thursday. But by Box-Toppers measures—and this is no knock on his 5-foot, 6-inch height—Altuve simply didn’t measure up. His 2.5 Box-Toppers points ranks 387th among all players, 90th among AL batters, 21st among all Astros players and 11th among Astros batters. Writers are touting Altuve for leading the league in hits (204) and batting average (.346). According to BaseballReference.com, his Wins Above Replacement (WAR) number is 8.3, highest among all players in baseball. But Box-Toppers looks at games one by one. And it seeks the one player who most helped their team win each game. Using standard box score statistics, Box-Toppers uses a simple formula to determine a Player of the Game for each Major League Baseball game played. That player is the person who contributed most to his team’s win. In regular season games, players earn 1.0 Box-Toppers point for being named Player of the Game and can earn bonus points for being Player of the Day or top player or batter in their league for the day. On July 24, he was Player of the Game in the 13-4 win over the Phillies, when he doubled twice and went 4-for-4, scoring three times and driving in three runs. 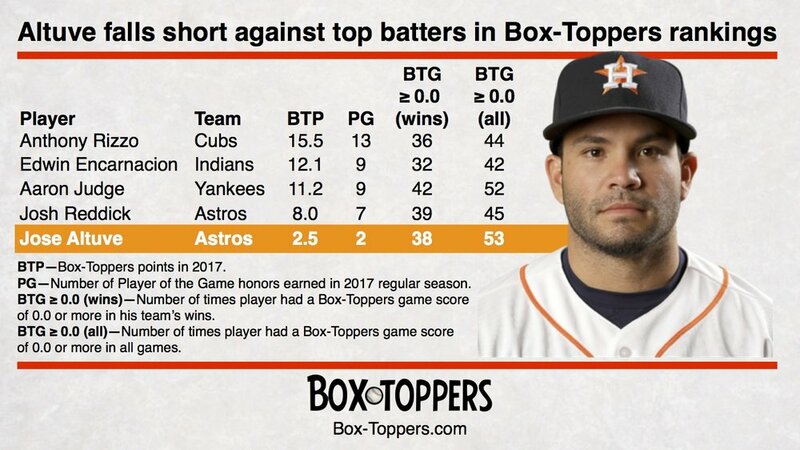 Altuve had the highest Box-Toppers game score that day among AL batters (+6.0) and also earned 0.5 bonus Box-Toppers points for being AL Batter of the Day. He earned a total of 1.5 Box-Toppers points that day. On Sept. 2, he was Player of the Game in the 12-8 win over the Mets, when he doubled and went 3-for-4, scoring three times and driving in one run. He had a team high Box-Toppers game score of +3.0 to earn 1.0 Box-Toppers point for the day. That was it. In the Astros’ 99 other wins, one of Altuve’s teammates had a higher Box-Toppers game score and beat him out for Player of the Game. Altuve ended the season with just 2.5 Box-Toppers points. The chart below shows all of the Astros’ 101 wins in 2017 and the Box-Toppers Player of the Game in each. It also shows how Altuve fared in each of those Astros’ wins. Since Altuve earned Player of the Game honors twice, there were 36 times he had a Box-Toppers game score of 0.0 or better and did not earn Player of the Game honors. Nineteen of those times, an Astros pitcher had a higher Box-Toppers game score and beat him for Player of the Game. Seventeen of those times, another Astros batter had a higher game score and beat him for Player of the Game. Five of those times that batter was teammate, outfielder Josh Reddick. Reddick in fact, was Box-Toppers top-ranked Astros batter in 2017, earning 8.0 Box-Toppers points, 11th among AL batters and 75th among all players. Reddick earned Player of the Game honors seven times in 2017, compared to Altuve’s two. He also had a Box-Toppers game score of 0.0 or more in 39 of the Astros’ wins, compared to 38 for Altuve. The question then becomes: How can Altuve be considered the AL player who helped his team win the most games, when he was not even the Astros batter who helped his team win the most games? That was Josh Reddick, who had more Box-Toppers points, more Player of the Game honors and more instances of Box-Toppers game scores of 0.0 or better in Astros’ wins. The only measure in which Altuve bested Reddick was number of total times they each had Box-Toppers game scores of 0.0 or more in all games. Altuve did it 53 times (38 in Astros’ wins and 15 in Astros’ losses). Reddick did it 45 times (39 times in wins, six times in losses). On July 4, Altuve and Reddick both had Box-Toppers game scores of +4.0, but Reddick won Player of the Game on a tiebreaker because he had more at bats (six vs. five). On Aug. 27, Altuve and designated hitter Brian McCann had Box-Toppers game scores of +2.0, but McCann won Player of the Game on a tiebreaker because he had more runs batted in (four vs. two). In other words, Altuve’s season would look very different from a Box-Toppers perspective, if he had earned Player of the Game honors in those contests in which he was within a Box-Toppers game score of 1.0 of receiving the honor. Winning Player of the Game in those eight additional games, would give him at least 10.5 points—probably more with bonus points—and put him in contention with Edwin Encarnacion of the Indians, who led AL batters with 12.1 points. In fact, if Altuve had prevailed in those very close contests, his 2017 Box-Toppers point total would probably look very much like his 2016 total. In 2016, Altuve had similar season statistics, leading the league in hits (216), batting average (.338) and finishing third among AL batters in WAR (7.6), but he also had far more Box-Toppers points—12.5, ranked third among AL batters. Here’s the thing though: Altuve did not earn Player of the Game in those close contests. Being close shouldn’t cut it. Being second- or third-best player of the day shouldn’t cut it. The award is Most Valuable Player not Second- Or Third-Most Valuable Player. How can a player who was not the MVP in 99 percent of his team’s wins (OK, 98 percent to be accurate—99 of 101 wins), be considered even MVP for his team, no less the entire league? Looking at Altuve compared with four of baseball’s top batters in 2017, Altuve and the other batters had Box-Toppers game scores of 0.0 or more in about the same number of games and about the same number of their teams’ wins. But looking at Box-Toppers points and Player of the Game honors, the other four batters left Altuve in the dust. Anthony Rizzo of the Cubs, who led all batters (and all National League batters) in Box-Toppers points with 15.5. Edwin Encarnacion of the Indians, who led AL batters in Box-Toppers points with 12.1. Josh Reddick, who as previously mentioned, leads all Astros batters with 8.0 Box-Toppers points. Rizzo leads in Box-Toppers points and also leads in number of Player of the Game honors earned with 13. Encarnacion and Judge both have nine, Reddick has seven and Altuve just two. Judge had a Box-Toppers game score of 0.0 or more in 42 of his team’s wins, most of the five players. Reddick has 39, Altuve 38, Rizzo 36 and Encarnacion 32. Altuve leads the way with most Box-Toppers game scores of 0.0 or better. He did it 53 times (38 wins, 15 losses). Judge did it 52 times (42 wins, 10 losses). Reddick, 45 (39 wins, six losses). Rizzo, 44 (36 wins, eight losses). Encarnacion, 42 (32 wins, 10 losses). So while Altuve has individual game Box-Toppers game scores that are comparable to the game’s top hitters, he simply didn’t have high enough scores often enough to be among the leaders in Box-Toppers points. On a game by game basis, he simply wasn’t the key Astros player contributing to the team’s many wins. But he had many opportunities. He played in 153 of the Astros’ games and 94 of the Astros’ wins. In the nine games he didn’t play, the Astros were 7-2, doing OK without him. In World Series Game 5 on Oct. 29, Altuve had a Box-Toppers game score of +5.0 in the 13-12, 10-inning win over the Dodgers. He hit a three-run homer, doubled and went 3-for-5, scoring three times and driving in four runs. In the AL Division Series Game 1 on Oct. 5, Altuve had a Box-Toppers game score of +5.0 in the 8-2 win over the Red Sox. He hit three solo home runs and went 3-for-4. The Houston Astros won 101 games in 2017 but Jose Altuve, a favorite for American League Most Valuable Player, was only Box-Toppers Player of the Game in two of those wins. Here's a look at his game-by-game performances in those wins, showing his Box-Toppers game score (BTG) and the game score of the Astros player who earned Player of the Game honors in the win. Each line shows an Astros win, the date, the game result, the Player of the Game and their Box-Toppers game score and whether or not they earned Bonus Box-Toppers points (BP) by earning overall Player of the Day, AL Player of the Day or AL Batter of the Day (listed under the BP column, respectively, as "MLB," "AL" and "BAT"). Altuve's results for the same game are shown to the right (you may need to scroll to see his stats), showing his Box-Toppers game score in each win and why, in 99 cases out of 101, some other Astros player beat him out for Player of the Game by having a higher Box-Toppers game score. Jose Altuve had a Box-Toppers game score of 0.0 or better in 53 games. He had a game score of 0.0 or better in 38 of the Astros wins listed above. In each game in which he had a score of 0.0 or better, the Box-Toppers game score is listed in bold and underlined. The two games he earned Player of the Game honors are highlighted in green. DNP—Jose Altuve did not play in these Astros wins. BP—Bonus points. Did the player earn Box-Toppers bonus points as top overall player of the day or top player or batter in the league for the day? MLB—Overall Player of the Day, worth 2.0 total Box-Toppers points. BAT—Top AL Batter of the Day, worth 1.5 total Box-Toppers points.